The dark theme hasn’t been implemented for learn.freecodecamp.org yet, but the team plans to do that when all of the fires are put out. There a couple of challenges, including the “Say Hello to HTML Elements”, that a few people have noticed don’t ever get marked as completed. For now you can just skip them using the curriculum map. You can also search for the challenge you want to work on using the search bar. I’m having this exact problem too. Plus, when I go to curriculum, it seem to be logging me out at learn.freecodecamp.org. When I log in it at that url, I’m put back to the welcome page. 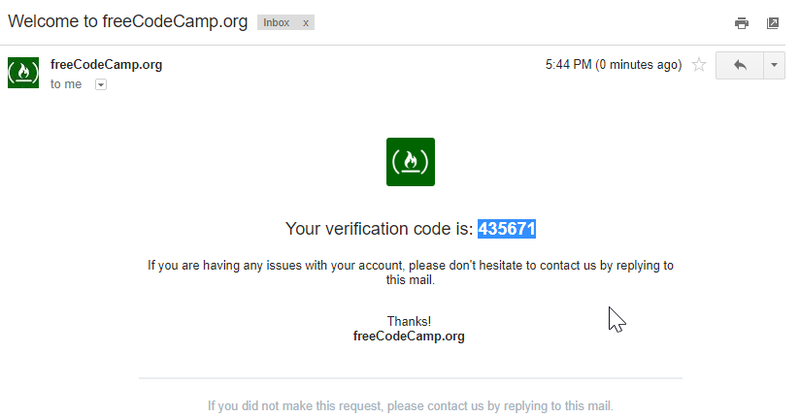 Then, when I click ‘Continue Next Coding Challenge’, I’m redirected back to learn.freecodecamp.org, and signed out again. I’ve cleared cache and cookies and I’m still stuck in this loop. When you click “Login” it will ask you for your email address. When you submit that, the page will change to ask for a code that was just emailed to you. go to learn.freecodecamp.org then look at top right corner. The login button is there . It says “Sign-in” and when I click it, I input my email and it doesn’t take me to somewhere when I can input the code I got. It looks like the label changed from ‘Login’ to ‘Sign in’ this afternoon. Alright, got it, thx. 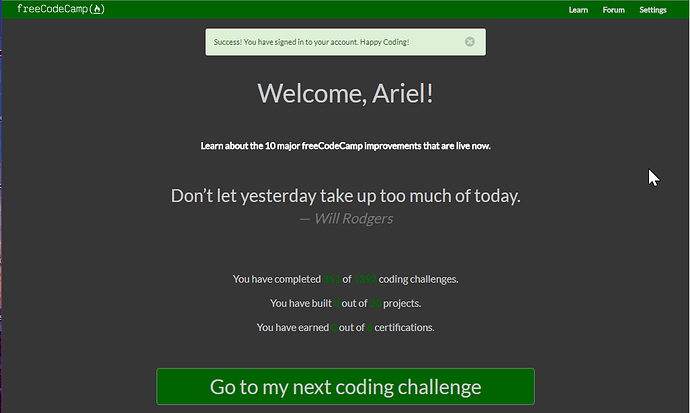 I’m now able to sign on learn.freecodecamp.org, but when I click go to my next coding challenge, I’m back at the beginning of the html section. There is a glitch on the very first challenge. It doesn’t get marked as completed for anyone. You can use the curriculum map to jump to a challenge or use the search bar. Same problem here. And when I see the mounth map, may is not registered. ??? Didn’t saw that post, I guess I look for info selectively when I have a particular issue. Thx both you and Ariel for helping. Please see my two screen captures below. Until they fix the bug you will have to follow these steps every time you have to sign into the platform. enter the code in the space provided and it should properly log you in showing your progress history. That is the way you are supposed to log in from now on. The good news is that it will keep you logged in until you change computers or clear your browser storage. Here is Quincy’s article about going password-less: 360 million reasons to destroy all passwords. Yes I understand that but most people, myself included, clicked the anchor link because I previously signed up with my github account. Clicking that link and following the steps puts you in what is effectively an infinite loop of logging in with no progress showing in your curriculum map. They just need to improve this process so clicking the anchor link makes you follow the correct sign in steps to get that email code. I did exactly you said. But still it take me to the first challenge of the html section. I think many campers face this issue. Did you follow my instructions above with the two picture instructions?